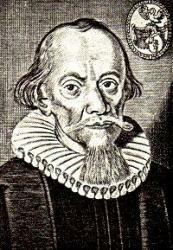 Much of Heermann's manhood was spent amid the distressing scenes of the Thirty Years' War; and by his own ill health and his domestic trials he was trained to write his beautiful hymns of “Cross and Consolation." Between 1629 and 1634, Koben was plundered four times by the Lichtenstein dragoons and the rough hordes under Wallenstein sent into Silesia by the King of Austria in order to bring about the Counter-Reformation and restore the Roman Catholic faith and practice; while in 1616 the town was devastated by fire, and in 1631 by pestilence. In these troublous years Heermann several times lost all his moveables; once he had to keep away from Koben for seventeen weeks; twice he was nearly sabred; and once, while crossing the Oder in a frail boat loaded almost to sinking, he heard the bullets of the pursuing soldiers whistle just over his head. He bore all with courage and patience, and he and his were wonderfully preserved from death and dishonour. He was thus well grounded in the school of affliction, and in his House and Heart Music some of his finest hymns are in the section entitled "Songs of Tears. In the time of the persecution and distress of pious Christians." (1) Devoti Musica Cordis. Hauss-und Hertz-Musica &c. Leipzig and Breslau, 1630, with 49 hymns (2nd edition 1636, with 64; 3rd edition 1644, with 69). The first section is entitled "Hymns of Penitence and Consolation from the words of the Ancient Fathers of the Church." Seven of these, however, have no mention in their individual titles of the sources from which they are derived; and the remainder are mostly based not on Latin hymns, but on the prose meditations in Martin Moller's Meditationes sanctorum patrum, or on the mediaeval compilations known as the Meditationes and the Manuale of St. Augustine. (2) Sontags-und Fest-Evangelia. Leipzig and Breslau, 1636, being hymns on the Gospels for Sundays and festivals. (3) Poetische Erquickstunden, Nürnberg, 1656; and its Fernere Fortsetzung, also Nürnberg, 1656 [both in Wernigerode], are poems rather than hymns. The hymns of the Hauss-und Hertz-Musica, with a representative selection from Heermann's other poetical works, were edited by C. E. P. Wackernagel, prefaced by a long biographical and critical introduction, and published at Stuttgart, 1855. 0 Jesu, Lord, who once for me, a good translation of stanzas i., ii., iv., v., viii., by A. T. Russell, as No. 158 in his Psalms & Hymns, 1851. Other translations are: (l) 0 Jesu! Bridegroom of my Soul," by J. C. Jacobi, 1722, p. 44 (1732, p. 73). (2) "Dear Saviour, who for me hast borne," by Miss Dunn, 1857. Thine honour rescue, righteous Lord, in full, by Dr. M. Loy, in the Ohio Lutheran Hymnal, 1880. "It is a powerful hymn filled with that prevailing prayer that takes heaven by force," and relates of st. vii.,11. v-7, "Eine Mauer um uns bau," that on Jan. 6, 1814, the Allied Forces were about to enter Schleswig. A poor widow with her daughter and grandson lived in a little house near the entrance of the town. The grandson was reading in his hymnbook those in time of war, and when he came to this said, “It would be a good thing, grandmother, if our Lord God would build a wall around us." Next day all through the town cries of distress were heard, but all was still before their door. On the following morning they had courage to open the door, and lo a snowdrift concealed them from the view of the enemy. On this incident Clemens Brentano composed a beautiful poem "Draus vor Schleswig." Jesu! as a Saviour, aid. A good tr. of st; vii., viii., xiii., by A. T. Russell, as No. 138 in his Psalms & Hymns, 1851. Sion bow'd with anguish weepeth A good translation of stanzas i., iii., v., by A. T. Russell, as No. 141 in his Psalms & Hymns, 1851. Another translation is: "Zion mourns in fear and anguish," by Miss Winkworth, 1869, p. 198.
v. Ach Jesu! dessen Treu. Love to Christ. 1630, p. 144, in 33 stanzas. One of his finest hymns, full of deep love to Christ, but from its great length very little used in Germany. Translated as, "Ah! Jesus! Lord! whose faithfulness," by Miss Burlingham, in the British Herald, May, 1867, p. 72.
vi. Der Tod klopft bei mir an. For the Dying. 1656, p. 22, in 121. Translated as, "That Death is at my door," by Miss Winkworth, 1869, p. 201.
vii. Du weinest für Jerusalem. Christ weeping over Jerusalem. 1630, p. 81, in 6 stanzas, entitled, "On the Tears of Christ." Founded on St. Luke xix. 41-44, part of the Gospel for the 10 Sundays after Trinity. The translations are: (1) "With tears o'er lost Jerusalem," by Miss Cox, 1841, p. 159. (2) "Our Lord wept o'er Jerusalem," by Dr. H. Mills, 1845 (1856, p. 295). (3) "Thou weepest o'er Jerusalem," by Miss Winkworth, 1855,p. 70.
viii. Herr Jesu Christe mein getreuer Hirte. Holy Communion. 1630, p. 74, in 9 stanzas, founded on M. Moller's Meditationes sanctorum patrum, pt. i. c. 11, and pt. v. c. 2. The translations are: (1) "Dear Saviour, Thou my faithful Shepherd, come” by Miss Dunn, 1857, p. 111. (2) "Lord Jesus Christ, my faithful Shepherd, hear," by Miss Winkworth, 1858, p. 93, repeated in Lyra Eucharistica, 1863-64.
ix. Herr unser Gott, lass nicht zu Schanden werden. Christ's Church. 1630, p. 114, as one of the "Songs of Tears," in 5 stanzas. Translated as, "Ah! Lord our God, let them not be confounded," by Miss Winkworth, 1869, p. 197.
x. Hilf mir, mein Oott, hilf dass nach dir. Christian Conduct. 1630, p. 32, in 7 stanzas, entitled, "For a better life. From the words of Augustine." Founded on No. i. of the Meditationes current under the name of St. Augustine. This meditation is apparently by St. Anselm of Canterbury. Translated as, "Lord, raise in me a constant Flame," by J. C. Jacobi, 1725, p. 27 (1732, p. 105). xi. Jesu, der du tausend Schmerzen. In Sickness. 1656, in the Fernere Fortsetzung, p. 79, in 12 lines, entitled, "In great bodily pain." Translated as, “Jesu, who didst stoop to prove," by Miss Winkworth, 1869, p. 200.
xii. Jesu Tilger meiner Sünden. Lent. 1656, in the Fernere Fortsetzung, p. 1, in 10 lines, entitled, "For Victory in Temptation." Translated as, "Jesu, Victor over sin," by Miss Winkworth, 1869, p. 201.
xiii. 0 Jesu, Jesu, Gottes Sohn. Love to Christ, 1630, p. 83, in 7 stanzas, entitled, “Of the Love, which a Christian heart bears to Christ, and will still bear." A beautiful expansion of his motto "Mihi omnia Jesus." The translations are: (1) "What causes me to mourn is this," a translation of stanza ii. by P. H. Molther, as No. 371, in the Moravian Hymn Book, 1789 (1886, No. 461). (2) "O Jesus, Jesus, Son of God," by Miss Burlingham, in the British Herald, Oct. 1865, p. 153, and in Reid's Praise Book, 1872.
xiv. Treuer Gott ich muss dir klagen. In Trouble. 1630, p. 103, in 12 stanzas, entitled, "Hymn of a sorrowful heart for increase of faith." Translated as, "Faithful God! I lay before Thee," by J. C. Jacobi, 1720, p. 9(1722, p. 70; 1732, p. 117), and as No. 538 in pt. i. of the Moravian Hymn Book, 1754.
xv. Wollt ihr euch nicht, o ihr frommen Christen. Second Advent. 1636, p. 210, in 9 stanzas, entitled, "On the day of the Holy Bishop Nicolaus. Gospel of Luke, 12 Chapter." Translated as: (l) "0 dear Christians, as 'tis needful, wou'd ye," as No. 153 in pt. i. of the Moravian Hymn Book, 1754. (2) “Help us, 0 Christ, to watch and pray," a tr. of st. ix. as st. iii. of No. 868 in the Moravian Hymn Book, 1789 (1849, No. 1221).